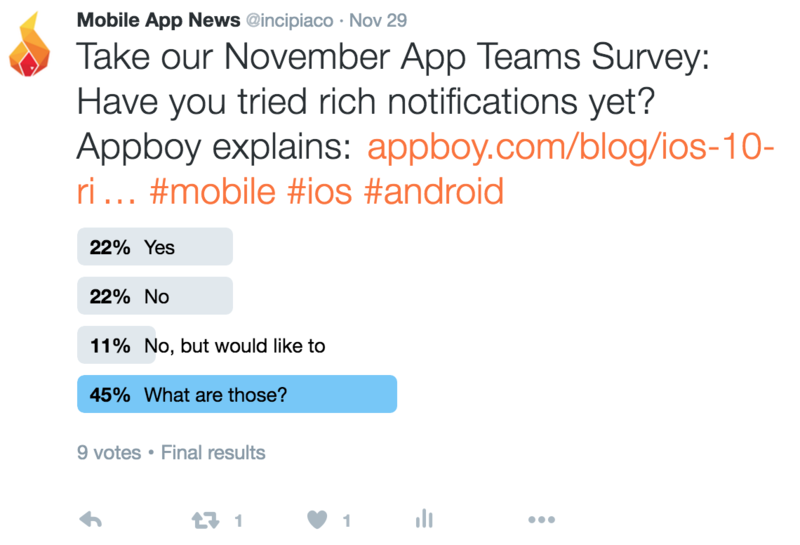 Here are the results from our second month's App Teams survey and poll, for November 2016. 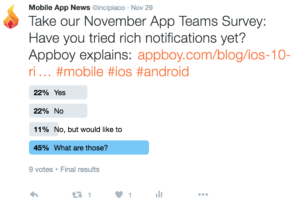 Twitter Poll – Have you tried rich notifications yet? With votes from 9 respondents, we were surprised that only 22.22% had tried this new user engagement technology, and that most respondents actually did not know what rich notifications were. For those of you who aren't familiar with rich notifications, push campaign vendor, Appboy created an explanatory post back when they were announced in August. Digging deeper into the trend, it seems that lack of interest in rich notifications prevails across the digital landscape; when compared to other iOS 10 updates (e.g. 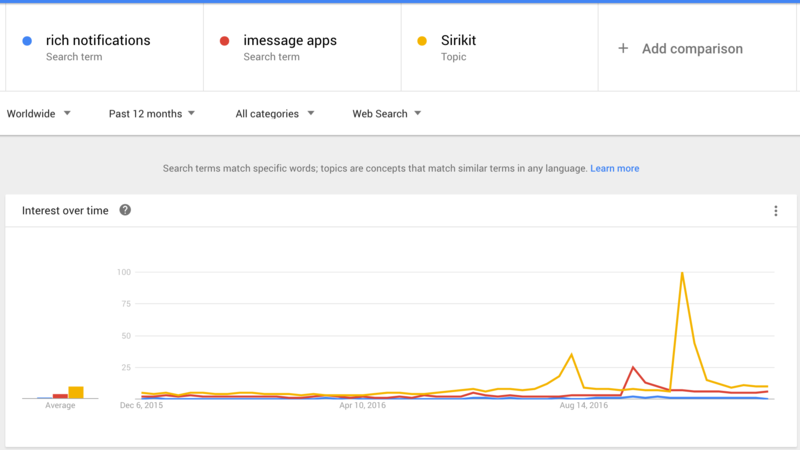 Sirikit and the iMessage app store), interest in rich notifications pales in comparison. It appears in this case, that rich notifications are stacking up to be a good idea that simply does not catch on, like 3D touch and Apple spotlight search. We'll be looking to implement rich notifications to see how they perform vs regular push messages, but if you have tried rich notifications and have feedback, we'd love to include your comments here. Just send a note to hello@incipia.co. In other, related news, Amazon announced their own push platform, moving push notifications further into the realm of a commodity technology and threatening to erode business from more expensive, specialized push vendors. App Teams Survey Question #1 – What was your top performing acquisition channel in the first month after launch? This was a follow-up question from last month's survey. It appears that all respondents did some type of marketing at first, but the good majority of respondents invested in only organic app store optimization, with 22.22% investing in influencer/PR marketing efforts. No respondents went for advertising from day one. Drawing from last month's survey, more than half started and stayed with ASO as their main marketing channel, but nearly all respondents said that they invested in marketing of some type (one respondent from last month indicated they did no marketing). 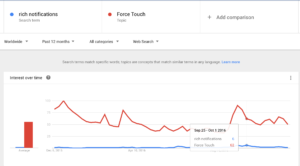 Responses to this question resonate with the potential of influencer/PR to drive a big boost of downloads in the all-important first month after launch, given that stakeholders will be judging an app's growth curve with the most scrutiny on launch, and Apple gives your app an artificial, 7-day boost to ranking. Coincidentally, we also received a highlight on the paid influencer marketing channel in our Medium article on marketing an app on a limited budget. App Teams Survey Question #2 – How concerned are you about limit ad tracking? Serve ads to only users who have not taken some action, so as not to pay for users who have already converted, i.e. installed or purchased. Target users by demographics or other user-specific data (i.e. additional options beyond time of day or geographic location). Calculate data based on post-install metrics, which are impossible to calculate for users with LAT enabled. (e.g. ARPU, ROAS, LTV). Per a Business Insider article, MMP Adjust reported in October that 20.5% of US users have LAT enabled, scrambling analysis and post-install attribution for one in five new installs, on average. While device fingerprinting is a workaround that can help identify users even with LAT enabled, this method requires a URL intermediary to work properly (read more here). While some platforms like Facebook have decided not to serve ads to users with LAT enabled, Apple continues to show ads to LAT-enabled users; yet, Apple does not push data of what percentage of new installs have LAT enabled to MMPs, like Adjust. This means that for some unknown percentage Apple search ads installs, no post-install data is eligible to be tracked, meaning that the aforementioned calculations for search ads campaigns are under-reported by an unknown amount; all other vendors, including Facebook and Google, show LAT rates for users in MMP dashboards, which at least provides a scope with which to gauge the magnitude of under-reporting. Two-thirds of respondents indicated that they were concerned to some degree with LAT, while no respondents were not at all concerned and one-third of respondents were unsure what Limit Ad Tracking was. There hasn't been much hubbub about LAT rates since October, which hopefully means that LAT has stabilized in the 20% range and won't get any worse. Let's hope that it doesn't and that Apple begins providing visibility into LAT rates. 77.77% of respondents indicated that they would hold their Apple search ads spend steady or increase their investment, while only 22% indicated that they didn't buy search ads, or were decreasing their spend. 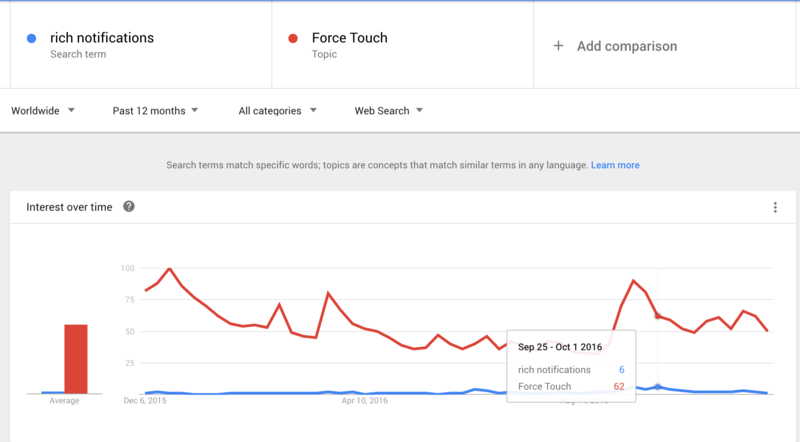 Apple search ads, while a bit of a pain to manage from a platform and data visibility standpoint, have seen significant ROI and further investment from iOS marketers since their official inception in early October. While the bad news is that this means prices (CPT and CPA) have increased, the good news is that prices were very low to begin with, and had some room to give. App Teams Survey Question #4 – What new technology are you most excited to leverage? Despite many new technologies pending on the horizon, most respondents indicated that they would stay the course with web and apps. VR/AR and Android Instant Apps came in second with two votes each, with the IoT, iMessage and "other" capturing one vote each. 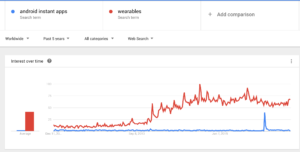 Wearables saw 0% interest. 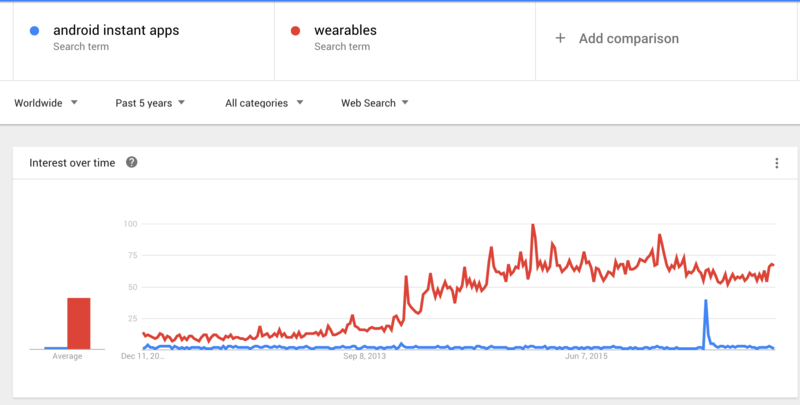 These results reflect the interest in, yet current nascent state of VR/AR and the IoT (we provide more color on VR/AR and the IoT here), as well as the blip of awareness about iMessage (per the earlier chart) and the plateaued, slight decline of interest in wearables. 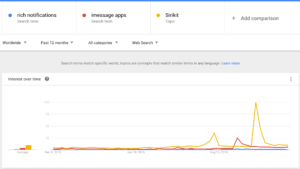 Android Instant Apps may hold promise, yet may also end up fizzling out as well; per below, interest for Instant Apps is more of a fad-level, rather than sustained. If you can think of a survey topic or question that you'd like to learn about next, send us an email or reach out to us on Twitter! Also, be sure to sign up to our email newsletter to receive the November App Teams Survey.